"Our democracy is stronger when everybody participates." The 2018 midterm elections are fast approaching on Tuesday, November 6. Tuesday, October 9, is the last day to register to vote in many states, including Arizona, Arkansas, Florida, Georgia, Indiana, Kentucky, Louisiana, Michigan, Mississippi, New Mexico, Ohio, Pennsylvania, Tennessee and Texas. (Rogelio V. Solis/AP) Madison County election bailiff Shirley Lewis unrolls several "I Voted" stickers that they give to each person who votes in their respective party in the Mississippi primary, June 5, 2018, in Madison, Miss. Ahead of the midterm elections, "Good Morning America" is highlighting some ways you can make sure your voice is heard, and how some organizations are stepping up to show there is no excuse to not hit the polls this November. 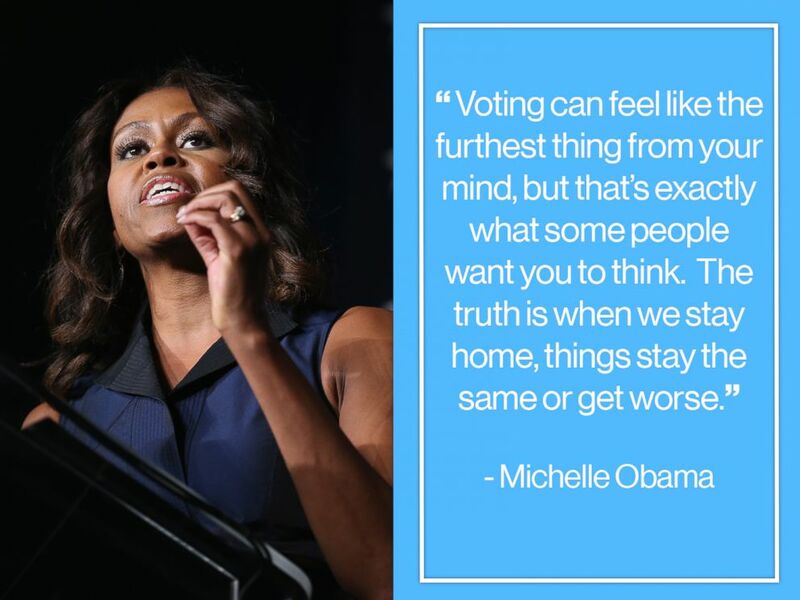 Stephanie Young, a spokesperson for the nonpartisan organization When We All Vote, which is co-chaired by former first lady Michelle Obama, told "GMA" that it is important to make voting a "collective" activity. Young recommends starting a conversation with those around you about voting, saying, "People are more inclined to listen to people that they know and trust." "It can help to encourage you," to hit the polls, she said, "and it can also help to hold you accountable. "Start a text chain, say, 'Hey, is everybody registered?’ You can literally send them our link," she said. "Then follow up with that text chain." 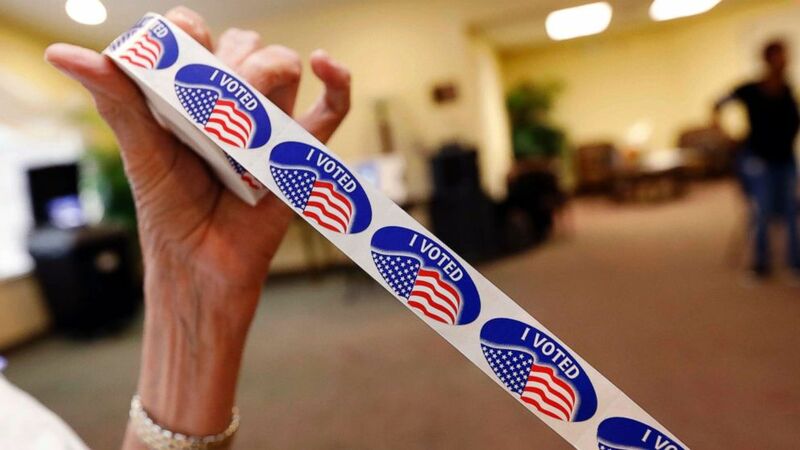 Carolyn DeWitt, the president and executive director of Rock the Vote, a nonpartisan nonprofit also focused on increasing voter turnout, reiterated that positive peer pressure is a good way to increase voter turnout, especially among young people. "Young people are a lot of times motivated by the collective, by being part of something," DeWitt told "GMA." In many states, registering to vote can be done online, which has been a huge way to increase voter turnout over the years, according to DeWitt. "We created the first online voter registration tool in 1999 and have been innovating it ever since. We have it available to partners for free; we have it available in 14 languages," DeWitt said. Using this tool, DeWitt says they have been able to add more than 8 million voters over the past seven presidential cycles. Plus, signing up online allows Rock the Vote to send election reminders, which DeWitt says have also been proven to increase voter turnout. You could also register to vote right from your phone, while scrolling on the 'gram. In honor of National Voter Registration Day, the social media platform Instagram is also making it easier for people to register to vote by implementing adds in feeds and stories that allow people to swipe up to register to vote or learn more about their states' voting rules, according to a company blogpost. "We have found over and over again ... the research tell us that young people don't participate at the same rate older voters do," DeWitt told "GMA" of voting. "A lot of times they are unfamiliar with the process and consequences." DeWitt says that they have noticed education programs are a big way to increase voter turnout, especially among young people. "Beginning last week we announced a program called Democracy Class, that is a free one-period curriculum on the history and importance of voting that culminates in them registering to vote," DeWitt said. Scores of school districts and organizations across the country -- including the Los Angeles Unified School District and the School District of Philadelphia -- have signed on to implement Rock the Vote's Democracy Class. Especially recently, DeWitt added that many young people are more motivated to turn out and vote when they are educated about critical issues, such as gun control. "Young people are extremely passionate about the issues," DeWitt said, adding that "helping young people understand how issues are actually impacted by the elections that are going on" is a big way to get them to the polls. 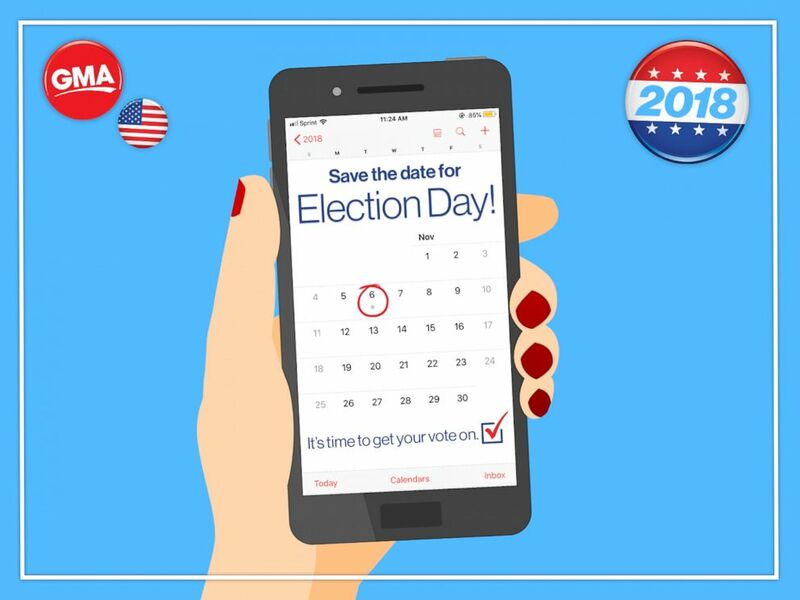 When it comes to the actual Election Day, Young recommends planning a day when you can all go together, as a way to hold friends and family members accountable. "You can also do something super cute, and say, 'Let's plan to have dinner that day after we vote,'" she said. "There are so many things that you can do, I love to get my nails done; you can do a little voter spa day." Whatever you decide, "You have to make it an activity, you have to make it a thing," Young added. "There's a number of things you can do, but it takes one strong voice that's determined to influence their loved ones and their friends in the right way," she added. It takes one strong voice that's determined to influence their loved ones and their friends in the right way. Finally, Young recommends doing whatever you need to do to hold yourself accountable. "We have to treat it like any other activity," she said. "We need reminders, we need an invitation, we need a calendar notification." (ABC News Photo Illustration) Make Your Voice Heard: Save the Date! 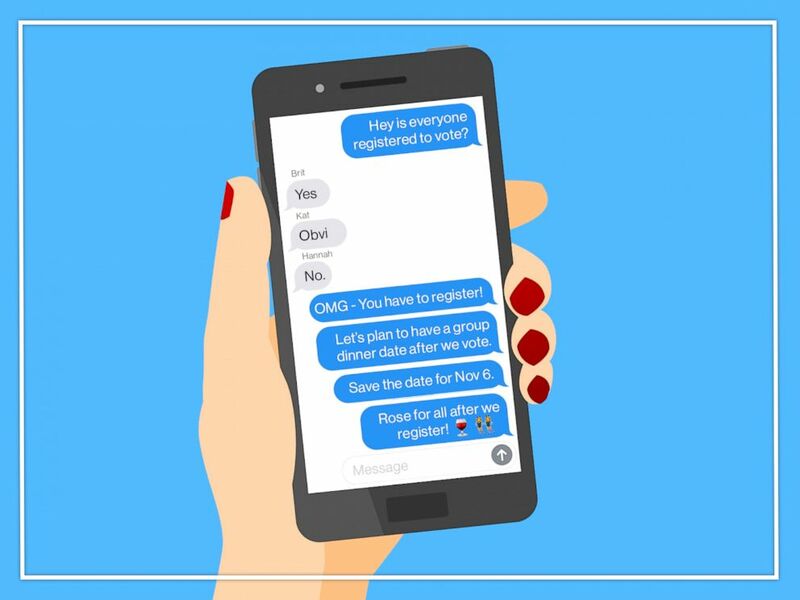 If you have friends that give logistical excuses on why they can't vote, or why it is difficult to vote, Young recommends encouraging them to think about what it means to stay home on Election Day. "I think that unfortunately voting has been made a little difficult in places around the country and that's not a surprise, that's a fact," Young said. "There is clearly a reason why some people want some people to stay home, and we need to stop and take a moment to think about it," she added. "We’re telling folks not to give their power away." 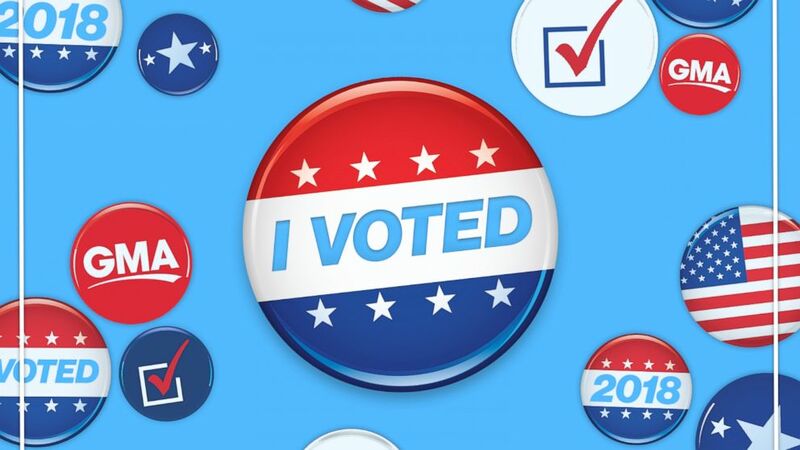 If transportation is an issue, there are a number of organizations, including the ride share company, Lyft, that are offering free or reduced-price rides to the polls on Election Day. "People are trying to make it hard and confusing and not the easiest process," she said. "But we’re letting people know that it's not hard as you think it is. "Our democracy is stronger when everybody participates," she added. In a PSA released by When We All Vote, Obama lists a litany of excuses for why people say they didn't vote, including everything from studying for exams to trying to get dinner on the table. "Voting can feel like the furthest thing from your mind; you might even feel like it's just not worth it. But that's exactly what some people want you to think," Obama said. "The truth is when we stay home, things stay the same or get worse." DeWitt added that it is also important to remember the context of what would happen if everybody, especially the young generation, thought this. 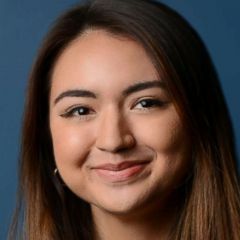 "Voting absolutely matters, you might not think that your voice or your vote matters, but when you put it with 70 million other young people, there's incredible power to decide the direction of not only our communities, but also our country," DeWitt said.